Some people tend to think that plain old text communication has lately become a thing of the past and alongside with it good writing skills are no longer necessary. It is, however, far from being true. A massive array of information (for instance, advertising alone) is still carried via written text, and to get the message through one has to put it clearly. Consequently, skilled writers, editors and proofreaders are still in demand (albeit, sadly, not every publishing house or advertising agency minds the poor quality of their products). In case you’d like to pursue proofreading as a job, either freelance or full-time, there’re some corner-stone rules you should keep in mind. First and foremost, a proofreader is not a Mr. Know-It-All – in this vocation you learn constantly. The two must-have useful habits for a proofreader are reading much and keeping dictionaries and other reference sources at hand. It is not only about spotting mistakes familiar to you; you must learn to discern and correct all kinds of errors. Secondly, your job is not to re-write all there is. 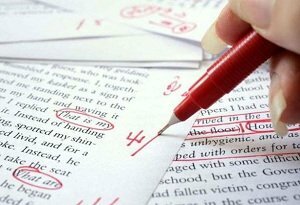 Moreover, if you take a fling at proofreading students’ academic works, keep in mind that you must only highlight mistakes and formatting inconsistencies, not provide the correct answers (except for spelling) or alter diagram labels, cutlines, calculations, etc. Some academic institutions frown upon third-party proofreading services (it is expected that students do it themselves). It goes without saying that your ability to focus is of paramount importance. Get down to work when your concentration is at its peak. If you have to proofread your own writing, put it aside for at least half an hour and swap activities to refresh your alertness. One simple yet effective trick to help you focus is placing a wide ruler or a cardstock piece under each line you read. Proofreading covers a wide variety of problems; it is not enough just to check grammar and spelling. So it is wise to proofread a text several times, looking for different mistake types at each go. In order to pinpoint spelling mistakes, typos and poor grammar, you may read text paragraphs in reverse order (from the end to the beginning) – thus your attention won’t be distracted by meaning. After you’ve done that, check accuracy of definitions, facts, figures and names; and it’s actually more important than it sounds, because a twisted fact may turn out to be libel and result in legal prosecution. In case the text contains tables, maps, photographs and charts or diagrams, be sure to check all the captions in small print twice as carefully as anything else. Headings in bold print need special attention, too – you don’t want to miss a blunder in what readers are likely to notice first. Consistency of written text depends not only on correct subject-verb, reference-pronoun and tenses agreement, but on clear and coherent formatting and structure as well. Not only does it make the whole work look neat but it also helps to perceive its content. By adhering to these simple rules you will be able to improve your effectiveness as a proofreader greatly – they may not seem like much, but they will do a world of difference if you follow them.